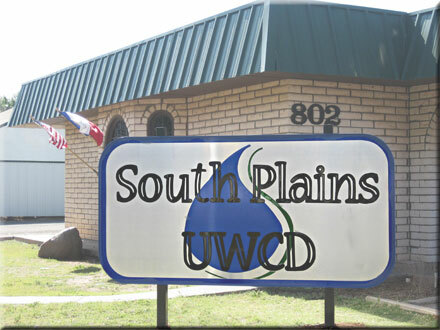 The South Plains Underground Water Conservation District was created by HB 281 (72nd Legislature) during 1991. The District was confirmed by voter approval, the initial Board elected, and an advalorem tax rate cap of $0.025/$100 valuation was set in an election held in August 1992. Originally, the jurisdictional extent of the District was the same as Terry County, Texas. However, in 1994 landowners controlling approximately 1200 acres of Hockley County, Texas, individually petitioned the District for annexation. Each petition was approved by unanimous vote of the Board. The District is committed, as permitted by Chapter 36, Texas Water Code, to the conservation, preservation, protection, recharge and prevention of waste of the groundwater resource over which the District has jurisdiction. The South Plains Underground Water Conservation District will develop, promote and implement management strategies to provide for the conservation, preservation, recharging, and prevention of waste of the groundwater resources, over which is has jurisdictional authority, for the benefit of the people that the District serves.